The foreign ministers of Greece and Macedonia signed an accord on Sunday to rename the former Yugoslav republic to "Republic of North Macedonia." The foreign ministers of the two countries signed an accord to rename the former Yugoslav republic the "Republic of North Macedonia", despite a storm of protest over a deal seen as a national sellout by some on both sides. public, and Macedonia's president has vowed to block the deal. "Very few believed we would be able to leave behind 26 years of unfruitful dispute," Greek Prime Minister Alexis Tsipras said. "We have a historic responsibility that this deal is not held in abeyance," Tsipras said as he and his Macedonian counterpart Zoran Zaev received a standing ovation. Tsipras survived a no-confidence vote mounted by the opposition in parliament on Saturday. But up to 70 percent of Greeks object to the name compromise, an opinion poll by the Proto Thema newspaper showed on Saturday. In Psarades, the tiny lakeside community where the deal was signed, the church bell tolled in mourning, draped in a Greek flag. 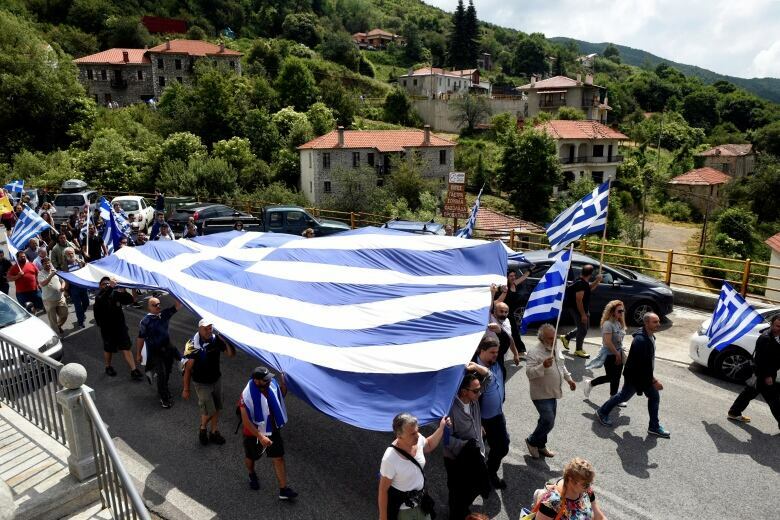 Some 30 kilometres away in the Greek village of Pisoderi, about 3,000 people rallied against the deal and at least six were injured in clashes with police who fired tear gas to disperse an angry crowd on a hillside. "We don't accept anything, we don't recognise anything. For us none of it is valid," said Costas Venetikidis, a protester. "Macedonia is in our soul, that's why we're here." Not far from the Greek border in the Macedonian city of Bitola, thousands protested draped in national flags, chanting "This is Macedonia." "This shameful deal will not pass. 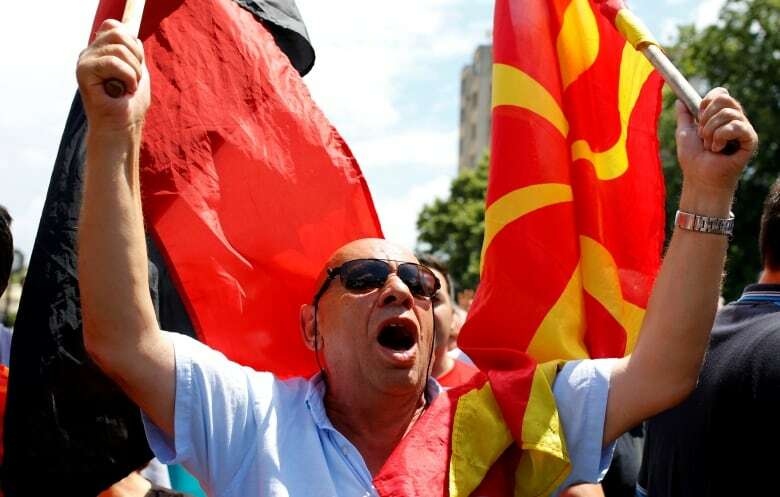 We will defend Macedonia's name and pride," said Petre Filipovski, 40.
province of Macedonia and an appropriation of ancient Greek culture and civilization. 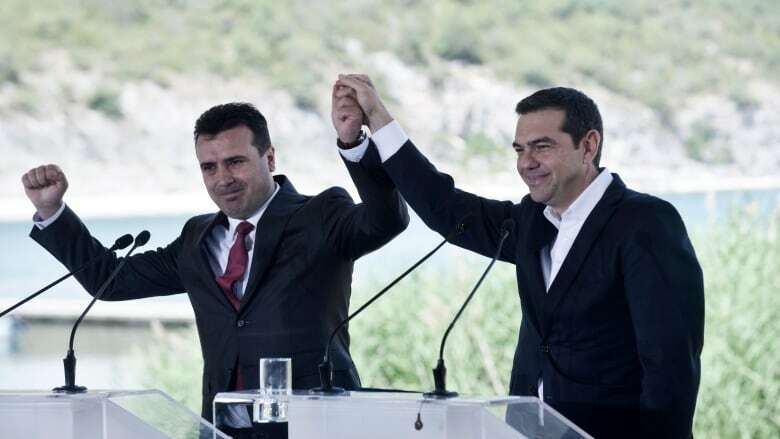 Zaev, who arrived from across the lake on a speedboat, said the two neighbours had "moved mountains" by reaching the accord. It was "a dignified solution acceptable to both sides", he said. can solve a problem if they really work at it." "Today is my birthday," said Nimetz, 79. "I told my family this year I don't need any gifts because two prime ministers are going to give me a big gift." Athens had blocked Macedonia's hopes of joining the EU and NATO, objections it must now lift under the deal. that this will see Macedonia join NATO," he said. "Given recent allegations of Moscow's involvement in other elections and referendums, this will be a real concern for NATO and the EU."